Glad you had fun enjoying the game! Especially that you got a few uses out of the physics engine, too, as I'm unsure how many people would run across. ^^; Still, good advice: I don't plan to do much afterwards, but I may tie an increase in resolution to the binoculars after the jam is over. I'm still just as bad as I was last time, but having 5 hits instead of 3 really helped me out. Made it to the first boss, at least! Wow, that was some intense platforming! The little puzzle runner, too, really mixed things up. Freezing enemies, moving them to different positions... gosh, great job with this one! And... the ending? Uh. I didn't expect it to be non-bones. Kind of cool. - The higher speed you attain, the harder it is to move your tank into 1x1 spaces. I'm not sure if that's intentional or not, but that's up to your design. - I noticed the view's resolution is interpolating, although the view area conforms to the 64x64 requirement. I believe while installing the game mentioned that it was made in GM:S2. Is there a similar work-around akin to "surface_resize(application_surface, 64, 64);" from GM:S1, or does your game use more complex surfaces than a simple line of code could fix? Other than those random opinions of mine, great job! That's a valid critique: I did spend a lot more time building the art assets and physics than incorporating good design into the game. I'll make sure to take that advice into the game I made the assets for, so thank you for your input! And enjoy the rest of the voting period for the #LOWREZJAM! Really awesome and addictive gameplay! Everything was spot-on in regards to polish, too. Just, make sure to fix the Browser/Web version so that the round timer starts. Otherwise, amazing! Fun little game, although it does repeat itself very quickly. I think I struggled a bit more with the sliding physics when I wanted to go through a narrow passage, but otherwise good job. Wow! Short, sweet, and to the point: amazing job with your entry! Wow, that was an intense adventure game! And the visuals were amazing, too! Fun little game! I'd like to add, though, that because I was button mashing, I skipped the ending scene when I lost. Otherwise, nice animations! Pretty challenging arcade game, but I did enjoy it. I must say it was fun! Wish there were more levels, though. Uh. Was it the feather? Because I didn't double-check to make sure the feather glitch wasn't removed. In any case, thanks for trying it out! Quite a challenging twist on the gameplay. 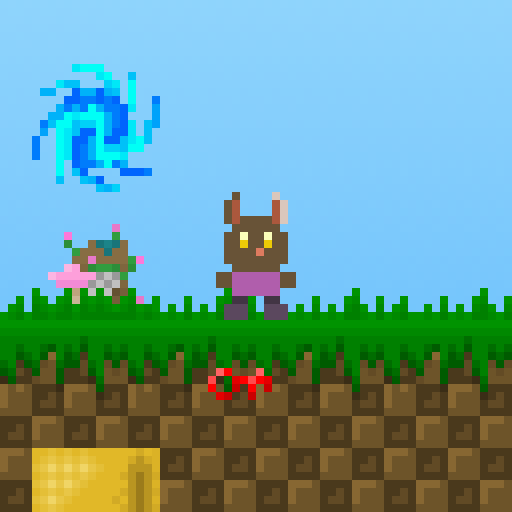 The flying animation is a little choppy; might help to have positions to slowly ramp to depending on what keys are held. And since figuring out how to aim is tricky, maybe a reticule could help? Not a GUI one, but, like, just a flying object at an in-between point for accuracy. The gameplay felt like blowing up giant gas cans, though! ^-^ That was fun! Like the concept. Graphics aren't bad, and you did a good job on both the score and the 64x64 resolution. Just, uh, next time? Make sure to put in controls for those of us who don't have numpads. You could use three throw-away keys like j,k,l, to throw the numpad events when pressed and released; however, without those extra buttons, I cannot get past the landing pad. Sorry! Great light mechanic for puzzle solving! Given the low resolution, you did an amazing job rendering the 3D space for both readability and atmospherics. Um. However you pronounce that. ^^; Also enjoyed the inclusion of the jump button! The third level was where the game really shined; when you added in the falling mechanic, I was excited to see what you could have done with it! ^^; And then the game ended. Aside from that, it's a solid outing save for the menu screens. They seem to be a little wider than 64x64, so maybe try implementing a page-turning mechanic next time, so you can keep to the resolution while still having the full tutorial in there. o.o;; 512x512 is kind of big for a screenshot, isn't it? Better make pixel perfect accuracy on some demon fights with flapppy bird cooldowns!! Better make some routes just end in your death instantly! Better make items spawn at the start you can't go back to! Better make some demons have such small hitboxes in comparison to their hp that you just stare, wondering if the slight hiboxes ever go against your favor! Better have items that do nothing!